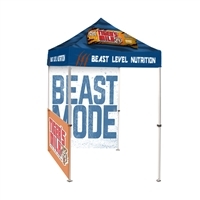 SignworldAmerica.com offers 5 ft and 10 ft UV-printed canopy tents, from simple 1-colour logo print tents to a variety of back wall and sidewall options with custom full-colour printing that will ensure your clients’ tent stands out from the crowd. Setting up these canopy tents is quick and easy, so they’re remarkably portable. Order today and your clients can be pitching their tents in as fast as 5 business days. Are you thinking of getting new Pop Up Canopy Tents to showcase your company at exhibitions or other events? Well then, our pop up canopy tents have been well-known for superb quality to price ratio and for extreme practicality. Our Outdoor Event Pop Up Canopy Tents are commonly used for outdoor exhibitions, trade shows or indoor events. We can even say that the highest number of them is used specifically for this purpose. In essence, they are your best choice for displaying your brand at any outdoor events. The possibilities are truly endless, allowing you to get the most from the best Pop Up canopy Tents we have. Pop Up Canopy Tents are more than just popular nowadays, they are a new standard set to replace traditional tents. The pop up mechanism allows to you to setup and take down your tent without having to assemble or dissemble the parts like traditional ways. Basically, the entire process is extremely easy and safe to complete the setup. Our Custom Event Canopy Tents comes with standard traveling bag to be transportation friendly and utilizes simple setup take down process to maximize portability. The entire structure of these tents is designed to be used and modified without the use of any tools. This is a huge advantage when it comes to portability as it saves time and makes the process simple. Most would believe that the size is the most important factor to consider and that bigger is better. A 10X10 Event Canopy Tent is usually treated as large enough for most events. However, according to our research and feedback from our customers, we determined that the size of a canopy tent should be based on the situation and setting of our customers needs. Our Pop Up Canopy Tents will be perfectly functional, practical and yet easy to move and transport. Take a look below for some detailed information about our custom canopy tent sizes and which would suit your needs the best. Our 10 x 10 Pop Up Canopy Tent is our largest size. It is ideal for showcasing your company at a large outdoor setting with plenty of people. Our 5 x 5 Pop Up canopy Tent is our smallest size, it offers a much higher flexibility allowing you to use it for both large exhibition or small outdoor events. Pop Up Canopy Tent combinations. 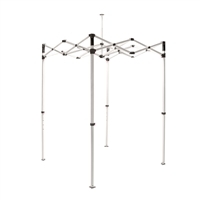 We offer a variety of canopy tent combinations that adds even more flexibility for you to place your tent in any position at any setting. Here we will have to mention the full color custom print advantage. It is a much better method for printing designs on our outdoor canopy tents, as it allows full color design to be printed without limitations. It is definitely something that should be mentioned, due to the fact this method eliminates traditional limits of imprint method and gives you unlimited creativity to your canopy design. In other words, your new tent will look refreshing and standout among many of your competitors. We also know that the time isn’t something business owners have to spare. As such, we offer a fast 5 day turnaround time for of all our magnificent tents. Are you looking for full custom printed tent with available backwall and sidewalls as add ons? Our Custom Event Canopy Tents come with optional add ons that make them more special. You can choose between the side walls or back walls, or you can get both of them. We also offer Canopy Tent Combos with add-ons already included, giving you more options to choose from. If you are looking for the Best Pop Up canopy tents, browse our categories and enjoy in all styles and combinations we offer. A 10 ft OutdoorCanopy Tent will be ideal for most outdoor events or trade shows. If needs arise, we have a smaller more compact 5 ft custom canopy tent that will fit almost any where at any event. With our full color custom printing service, you are going to get a tent that will be the eye candy at any exhibition or event.